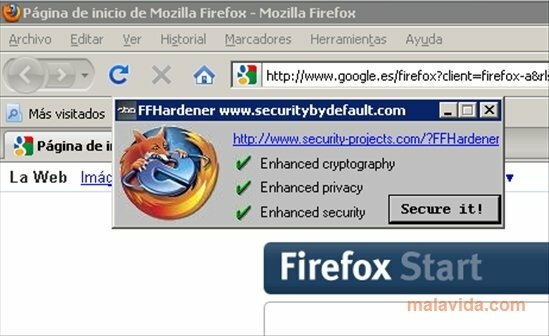 An program with a lot of popularity lead to "the bad guys" paying more attention to it when it comes to plotting their misdeeds, that is why, Firefox receives more attacks each day. 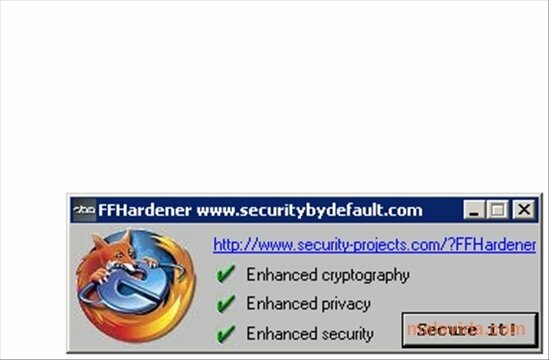 Even though no software is error free, the truth is that some parts are more prone to generating security holes than others, and since the vulnerable parts of Firefox are well known, FFHardener tries to offer some order and conceal the problems that the browser by Mozilla may have. 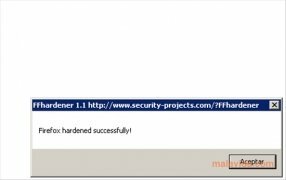 Once FFHardener has been downloaded, its functioning depends simply on pressing the only button that is shown in its interface, and that will prop up the weak points of Firefox. Basically, its action lines consist in making sure that no R4 algorithm is used in the SSL connections, because it is an insecure encryption, furthermore it forces the use of 64 or 128 bit algorithms. What's more, to increase privacy it makes sure of deleting all the browsing history as well as the stored pages cache.